Last week, Marketing Lessons from the Grateful Dead, which I wrote with HubSpot CEO Brian Halligan was released in the Japanese language. The book is doing great. It's been ranked in the top 20 or so of all books sold on Amazon Japan and most physical bookstores have already sold out so the publisher has ordered another print run. 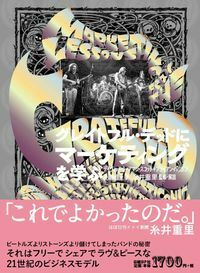 Brian & I are psyched to introduce the ideas of Grateful Dead marketing to Japanese businesses. Much of the Japanese edition's success can be attributed to Shigesato Itoi, the visionary who brought together the all-star team that worked on the Japanese edition. Itoi-san is a popular cultural figure in Japan who is a pioneer in Web content creation. He's got a remarkable 430,000+ Twitter followers @itoi_shigesato and his Hobonichi site is one of the most active in Japan. Hobonichi is based on excellent content. A particularly interesting aspect is daily content available for only 24 hours and then disappears. There is no archive of the daily information. This unusual content strategy is exactly the opposite of what SEO experts would tell you to do and therefore, because it is unique, is a very Grateful Dead approach. Itoi-san and I traded Q&A back and forth about how he creates real-time content. 1) When we met in Boston, you struck me as unique in the Japanese marketplace because you create content for your buyers. Most other people in Japan create content that talks about what the products do. How did you become so "unusual" in the Japan market? It's almost happenstance. In 1998, I launched Hobo Nikkan Itoi Shimbun, or Hobonichi, with no prospect for selling merchandise. My intention was to take what I think is interesting, edit the stories like a newspaper (Shimbun means newspaper in Japanese), and put it out on the web for many to read. As we were searching for revenue to sustain Hobonichi, I stumbled upon the idea of selling products, which I think is also content, only that it takes physical form. There was no grand plan. 2) How do you create content that is interesting to people? I see Hobonichi as a shop where we create "content." For us, content is an idea, emotion, or that light bulb that turned on in your head, expressed in various ways such as text, performance, or a physical object, i.e. products. I keep on producing "content" to meet new friends -- readers, customers, collaborators, vendors, who will enjoy them with me. It's like a kid in an open lot with a ball and a bat, starting the game, and always waiting for someone to join. 3) I consider your content to be real-time because it is only available for one day and then it disappears. You do not have an archive of past content. Why do you do this? It was an intuitive decision I made from the very start. Maybe it's because it allows me to discuss the same theme over and over again. It's natural: don't we do that every day? Perhaps I wanted to replicate this behavior. That said, I still haven't found a good answer for this one. 4) When I met you in Boston early this year, you struck me as someone who is happy with your life's work. Why do you think so many Japanese people are stuck in jobs that they do not enjoy? I think it's because the Japanese work ethic values obedience to orders and skillful delivery of results. Each of us needs to be our own leader to live our own lives. Unfortunately, those people are not. 5) Why did you decide to work on the Marketing Lessons from the Grateful Dead project? I am attracted to things and people who tell me "Being free does not lead to decadence. It brings out potential." My job is to disseminate this message. The more people there are who believe in this, the easier my life will be. Well, at least, I'm hoping it will make my life easier.